Watch Hobbs, Gregory, Grimmett, Rhodes and more. England has not won a Test match for 9 days. If you are suffering painful withdrawal symptoms Third Man has the answer. 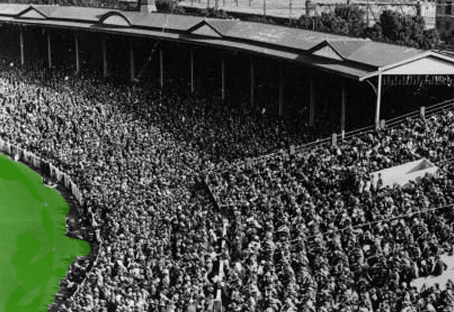 Have a gander on YouTube at this BFI Film of England’s glorious victory against Australia at the Oval in 1926. TM did make available another film of events from this series here – but the quality of this BFI film is of a different order. 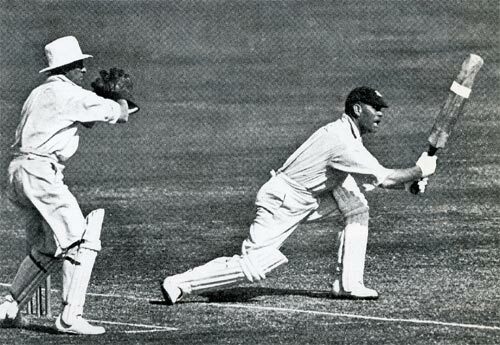 There are bright and sharp clips of Hobbs and Sutcliffe’s running between the wickets, gloveless Gregory, Grimmett’s arm speed (which Warne would admire and which must have produced considerable rates of rotation on the ball), Rhodes snaffling a 4fer and Mailey desperate to get his hands on the ball for a souvenir. 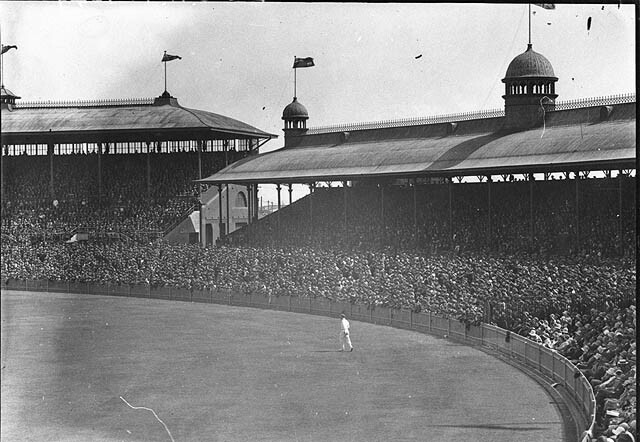 Percy Chapman preux chevalier now led his merry but generally elderly men on from their seismic victory at the Gabba described earlier to the cauldron of Sydney Cricket Ground where the outfielder senses intolerable isolation in a crowded place and even the wicketkeeper can hear himself barracked. 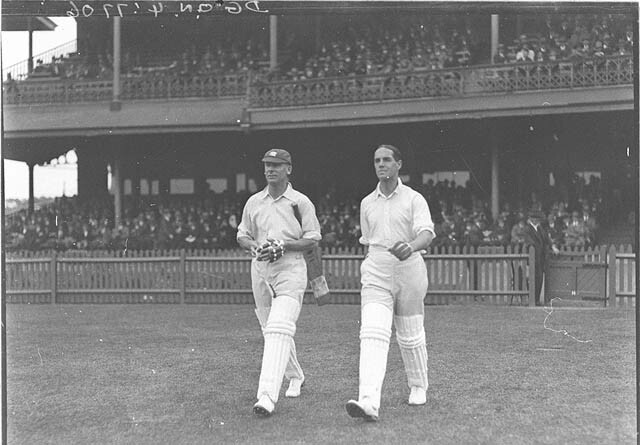 Mead had played his last Test and made way for Geary. For Australia, Richardson replaced Bradman, the gentle Nothling came in for the broken Gregory, who had therefore also played his last Test, and the off-spinner Blackie made his debut at the unlikely age of 46. The effects of the carnage of the First World War are clear to see with each side missing the Lost Generation of young players who might have been. Hobbs and Sutcliffe opened the innings and put on 37 before Sutcliffe's dismissal brought forth Hammond. Australia were bowled out for 253 with Geary taking 5 for 35 in 18 overs and Larwood picked up 3 for 77 in 26.2 overs. Controversy attended the early dismissal of Kippax who was bowled off his pads from outside leg stump but the batsman claimed that ‘keeper Duckworth had broken the wicket. The scene was then set for Hammond to take command. Coming in with England at 37 for 1, he reigned supreme for 7 hours 41 minutes during which time he scored 251 in England’s total of 636 all out. 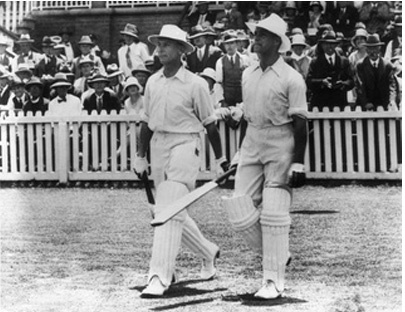 Australia’s second innings of 397 contained centuries for Barnacle Bill Woodfull and the multi-initialed H.S.T.L Hendry, but it was barely enough to make England bat again and the tourists won the second Test by 8 wickets and went 2 – 0 up in the series. Tate bowls to Hendry probably on his way to 112 in Australia's second innings. Some consolation for the crowd but not enough to to forestall an eight wicket drubbing which gave a cricket mad country much to talk about. The Australian crowds and commentariat were in two minds. Either this was the worst, oldest and least worthy side ever to reach Australian shores or given the results so far, the luckiest. The temperature metaphorically as well as literally was rising as the antipodean spring turned into high summer. Four years later Jardine was to use the following quotation from R.W.Thompson’s Down Under, a non-cricketing account of a period he spent in the Dominion, to show that the reaction in 1932/33 was in many ways no different to that which had preceded it. Jardine obscures the names so that his 1934 readers might at first think it was a report of that winter’s tour, but in 2010 there is no need for such artifice. Yet, if the temperature was rising, it was to soar yet further as both sides made their way to Melbourne and the New Year Test. 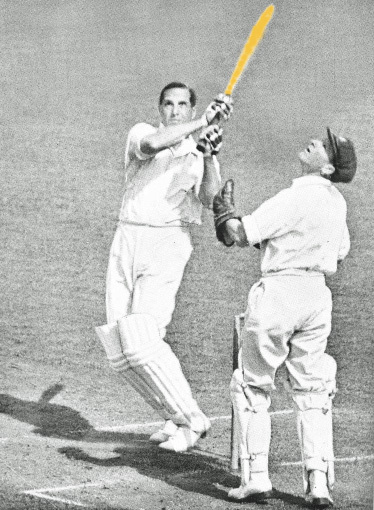 The Emperor’s New Clothes or Wearing a T-Shirt for Douglas Jardine. The not so humble T shirt, the undergarment that ‘came out’, self coloured or tye-died, ringer or billboard, utilitarian or expressive, mute or shrill – should we wear one for Douglas Jardine? The boys at philosophyfootball think we should and for this winter’s Ashes tour they have selected for one of their garments the Harlequin’s strikingly modern campaigning assertion that “Cricket is a battle and service and sport and art”. History has been cruel to this Lion of England. In every way, opinion has moved against him and towards his foes – the hecklers on the Hill, the journalists of Nineteen Thirties Australia, his Establishment familiars, even his ambitious Vice Captain. Yet, if anything, culture has moved towards his approach if not his heritage. 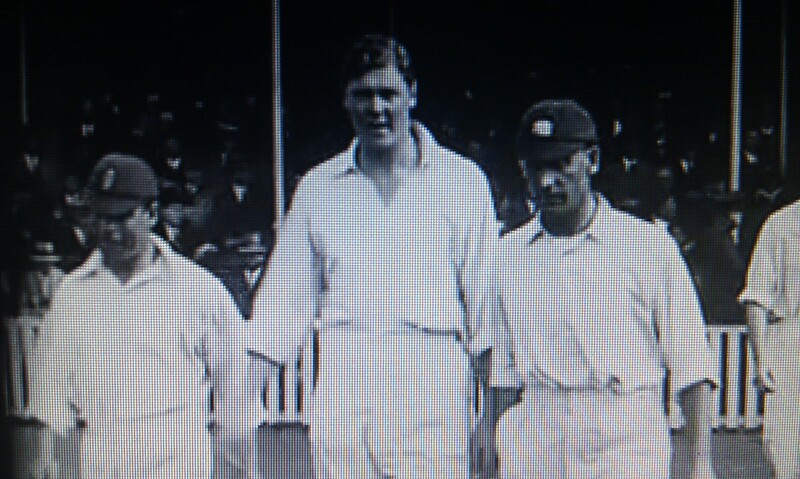 Who would not fancy him to bring back the Ashes in 2011 – as he did in 1933 – four, one? Cricket has become more professional, more abrasive, more ‘win at any cost’. In other circumstances Jardine might be regarded today as a hero of the game, but Third Man doubts he will be inducted into the ICC’s Hall of Fame. Cricket long ago clothed itself in a myth of fair play and idealised virtues. Was it the way the early aristocratic enthusiasts excused their dalliance with the lower orders in pursuit of the demeaning shepherd’s game? Was it the pretence by which schools prepared their pupils for war and colonial administration? Was it a convenient narrative by which old professionals romanticised their playing careers and obscured their humble origins and self-serving match-play? Big cricket cricketers have always found the garment course fitting, so why has Jardine, remained unfashionable? The costume that today configures itself in the folds and frills of the Spirit of Cricket may be a fig leaf, but nevertheless it must be worn at all times with respect and subservience. 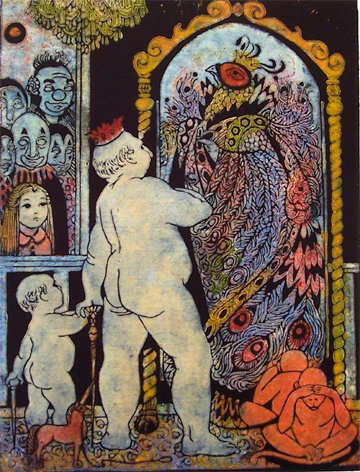 He who questions too closely the Emperor’s new clothes risks becoming a lightning rod through which the guilt and greed of others reaches the ground. Is it time therefore to rehabilitate Douglas Jardine? As in most things, we must start much earlier. In November 1928 the genial Percy Chapman led a team Down Under. As now, after a long period of dominance, Australia, with their great players aging or retired, were finding it hard to reconstruct their side. Percey Chapman wore a funny hat and thumped Australia 4 -1 but the game has been far kinder to him than it has to Jardine. 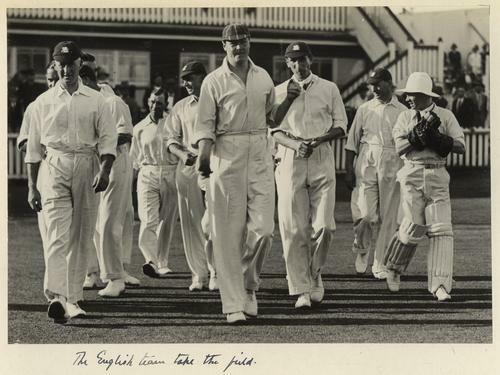 England on the other hand were able to send the following batting order to the printing office at the Gabba as the series begun on the morning of November 30th: Hobbs, Sutcliffe, Mead, Hammond (a debutant in this match who was to score 905 runs in his 9 Test match innings on this tour), Jardine (another debutant), Hendren (who, coming in at the crisis point of the match, if not of the series, when England were tottering at 161 for 4 on that first day, scored 169 of England’s first innings of 521 in a five hour game-changing innings ) and Chapman himself. Patsy Hendred on his way to 169. Has he actually got a lot to answer for? These batsmen were complemented by a bowling attack of Tate, Larwood, White, Geary (in subsequent Tests) and Hammond. In reply, Australia lost their first four batsmen for 40 in a disastrous last hour of the second day and eventually sunk to 122 all out. 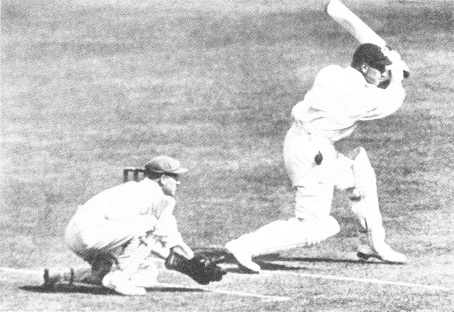 The youth Bradman, who had already scored 295 runs against the tourists for twice out, was lbw to Tate for 18 batting at number 7. Larwood took six for 32 in 14.4 overs. Tests being timeless affairs in those days, England batted on to 342 (Mead 73, Jardine 65*) in their second innings before declaring 741 runs ahead in time to take the wicket of Ponsford before the close of play on the fourth evening. Overnight rain then made batting conditions treacherous and White 4 for 7 in 6.3 overs, Tate 2 for 26 and Larwood 2 for 30 sent Australia to a crushing and demoralizing defeat by 675 runs. The impact on the home side’s supporters, their media, their cricketers past and present and especially on Bradman would have far reaching consequences.